Updated 8/20/18. At Disneyland, free items abound. In fact I would say that free and Disneyland go hand in hand (or Mickey Glove in Mickey Glove). There are numerous free experiences and items available at the Disneyland Resort if you know where to look. 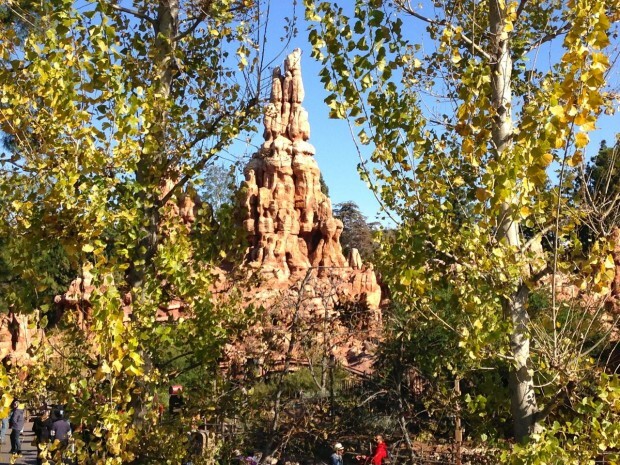 This list covers the noteworthy free items scattered throughout the Disneyland Resort beyond the obvious shows and attractions which are all included with the price of your Disneyland tickets. The list is a helpful companion to the popular 18 Disneyland Money-Saving Hacks article and our guide to Disneyland. 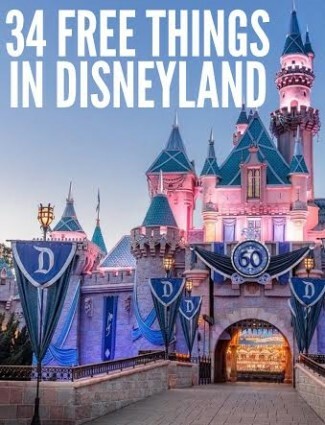 Enjoy the list and be sure to leave a comment with any other free things at Disneyland you enjoy. Before you even leave for you Disneyland trip, you can receive something for free. Disney offers a free planning video that provides a helpful overview of the theme parks, hotels, and Downtown Disney shopping district. This video is extremely helpful in planning your trip, or just nice to watch while you are away from the parks. This is another item you can receive before you ever set foot inside of Disneyland. Disney will send you an autographed character photo if you send a letter to the address below requesting a nice character note. Rather than purchasing bottles of water, you can request free cups of ice water from any of the various Disneyland counter service restaurants. Be sure to ask for a LARGE cup of water so that they don’t give you the dinky small sized ones. 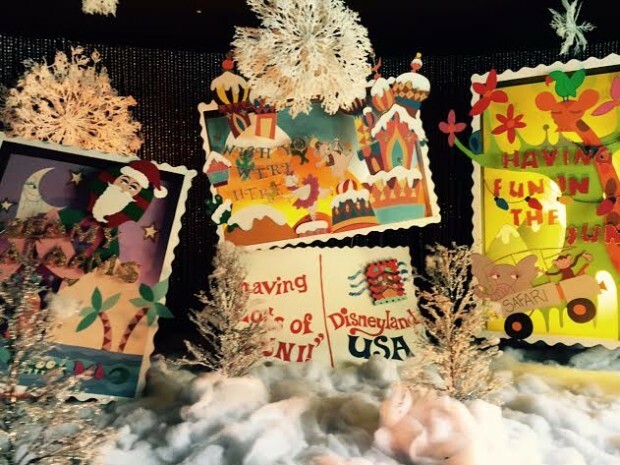 There are many different paper products used throughout Disneyland. The Disneyland FastPass you collect to enjoy attractions, time guides informing you of different show times, and the park maps passed out at the entrance all make great keepsakes for any scrapbook or collection. 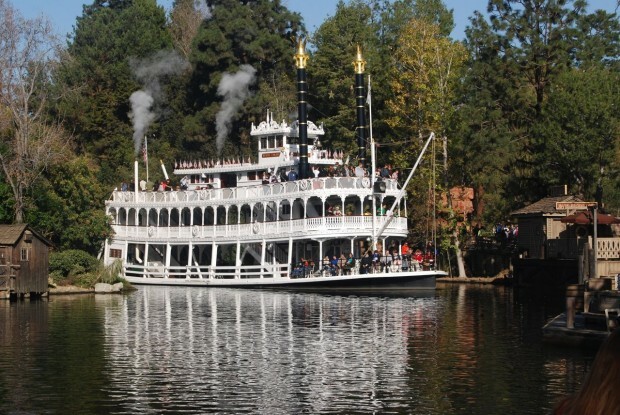 While the Mark Twain is operating, you can be selected to be an honorary riverboat captain. Not only will you get to experience a trip around the river in the pilot’s quarters, but you will receive a special certificate in thanks for your help. The Cast Members on the Mark Twain Riverboat usually pick a family with a young child, so if you fit that description it can’t hurt to ask them. 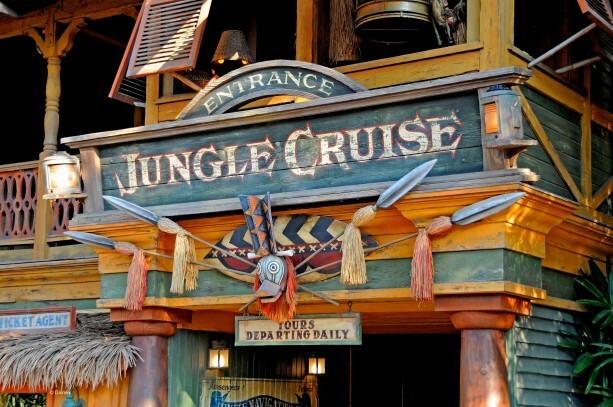 Right after disembarking from the world famous Jungle Cruise, ask one of the Cast Members for a map of the attraction. They often run out, so be sure to ask early in your trip because you may need to return in order to secure one. There are special Disneyland buttons to celebrate almost every occasion, from birthdays to graduations. You can pick up a button at almost any store in either theme park and always at the Guest Relations kiosk just inside both theme parks. Check out other ways to celebrate a birthday in Disneyland. 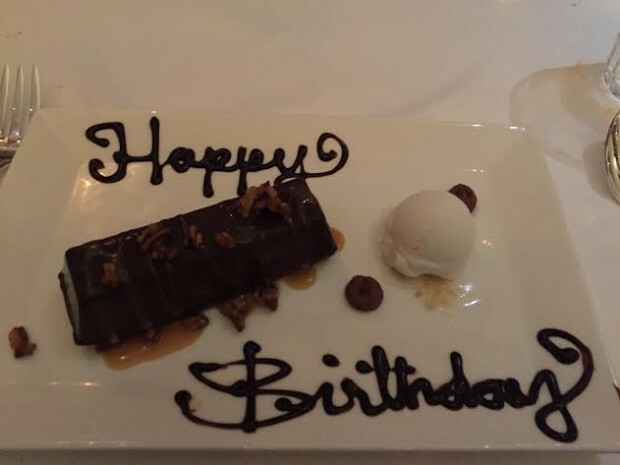 Almost every table service restaurant will help you celebrate your birthday with a free dessert after a long meal. 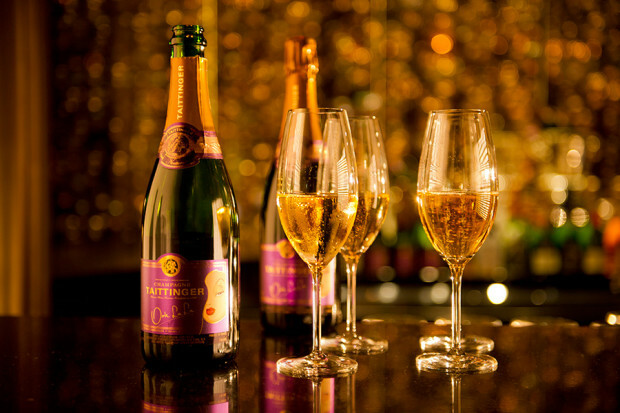 Make sure to mention that you are celebrating a birthday when you make the reservations via Disney Dining. 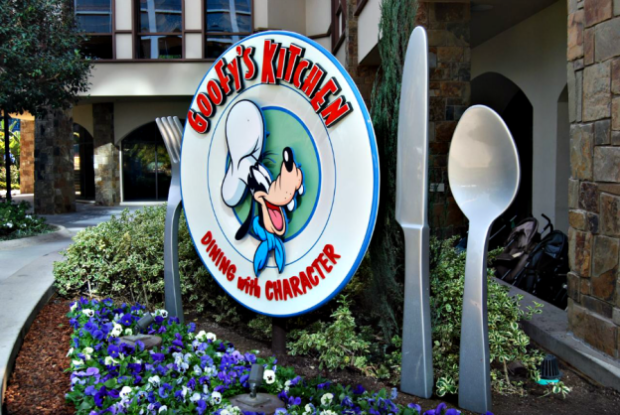 See all of our advice on Disneyland Dining options and how to get the best reservations. 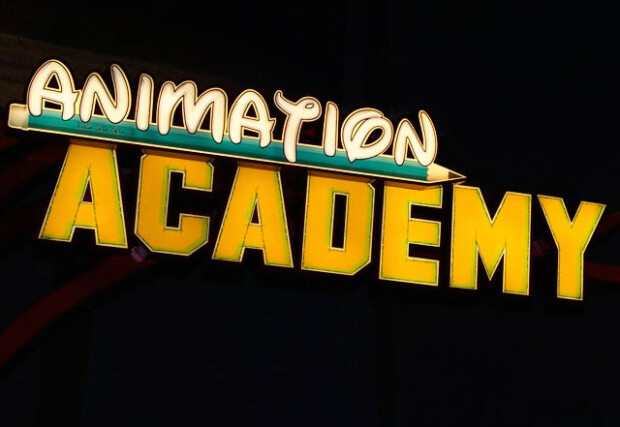 The Disneyland Animation Academy is the perfect place to learn how to draw your favorite Disney characters. Then, afterwards take home your artwork to be proudly displayed. The teacher will often also give out their artwork to someone in the class afterwards. Your luck will vary on this one. Sometimes teachers refuse to give out their sketches. 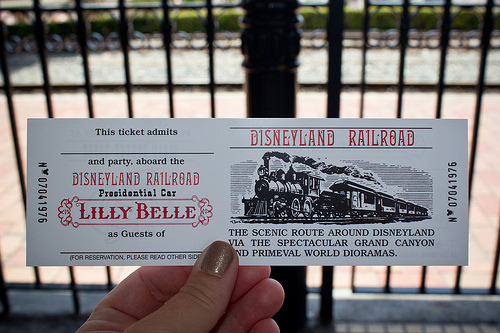 Disneyland Lilly Belle ticket. Image source. When the Disneyland Railroad is operating, one of my favorite hidden experiences is riding the Lilly Belle car. This special train car was created to provide VIPs a secluded way to enjoy the Disneyland Railroad. Now it is available as part of Disney’s Grand Circle Tour. You can ride up in the front cab of some of the train engines. This experience is fantastic and you will be able to meet some incredible Cast Members. 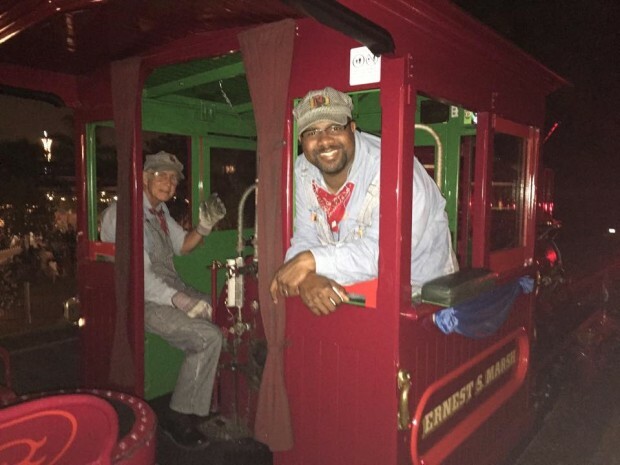 Because the trains just returned from being down for a year, Disney is retraining their Cast Members the procedures on having guests up in the tender of the cab before they reopen this experience. From what I have heard, they hope to bring the tender rides back around January. 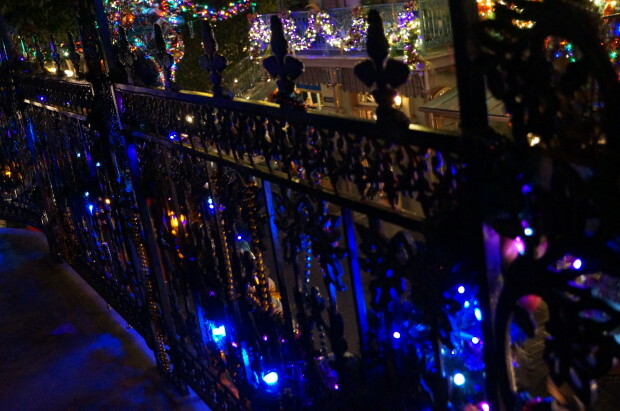 The picture above comes from the upstairs balcony of the exclusive private Club 33. The many musicians who play in the French Market area of Disneyland often carry Mardi Gras beads to throw to enthusiastic members of the audience. The more you are dancing and excited while listening to the music, the more likely you will be to receive beads. 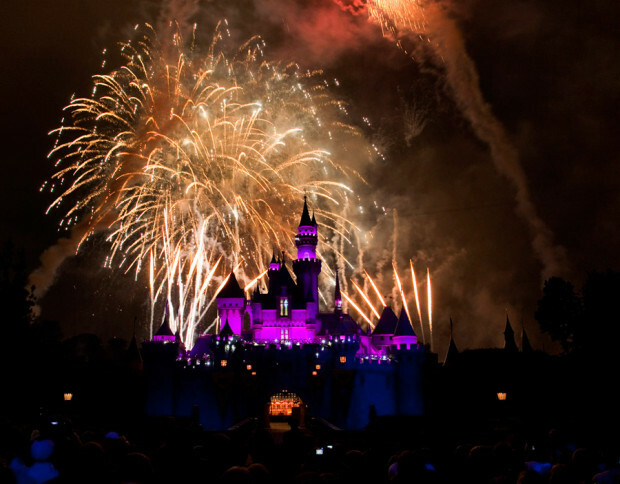 On New Year’s Eve Disneyland goes all out with special bands, fireworks, and free hats and horns for all of the guests. The hats and horns are a nice festive addition to get everyone in the mood for the new year. 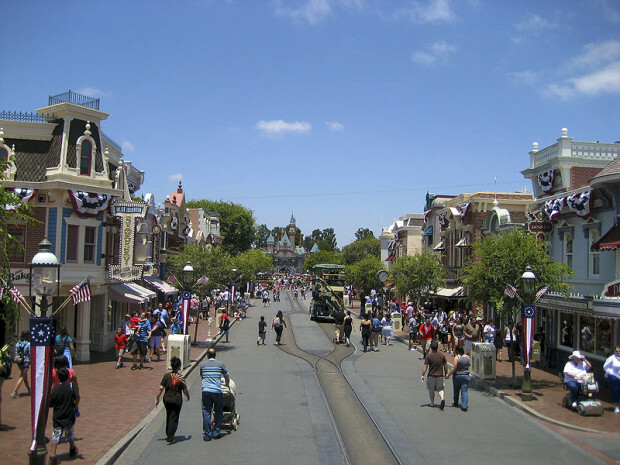 Related: Check out our suggestions for what to do when Disneyland is crowded. Ghirardelli’s Chocolate Shop located in the Pacific Wharf area of the park gives out free chocolate squares to all guests who enter the shop. 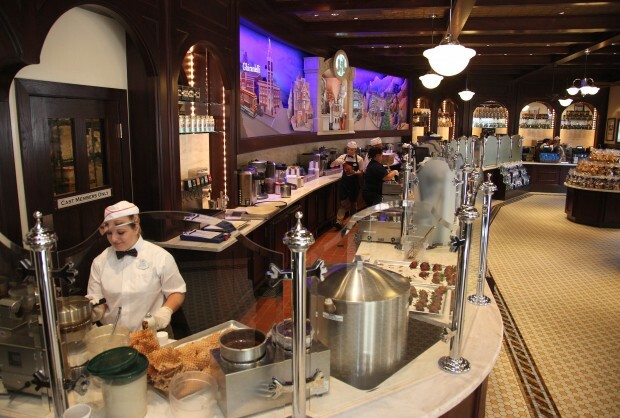 Right across the street from Ghirardelli you will find the Boudin Bread Factory Tour. This perfect sourdough makes for a great snack on it’s own OR by combining the free chocolate from Ghirardelli to make a CHOCOLATE BREAD SANDWICH. Many Disneyland Cast Members carry stickers to give out to kids. Most janitorial Cast Members (sweeping up trash in all white) will be more than happy to give you a sticker. Also, any Cast Member taking surveys usually has stickers to give out to people who complete the surveys. 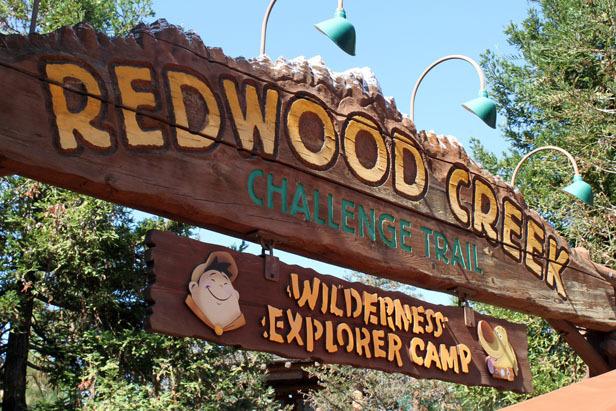 Check in with the Cast Member at the entrance to the Redwood Creek Challenge Trail to find out how your child can become a Senior Wilderness Explorer. After completing all of the tasks, they can be rewarded with their own very special Senior Wilderness Explorer badge. 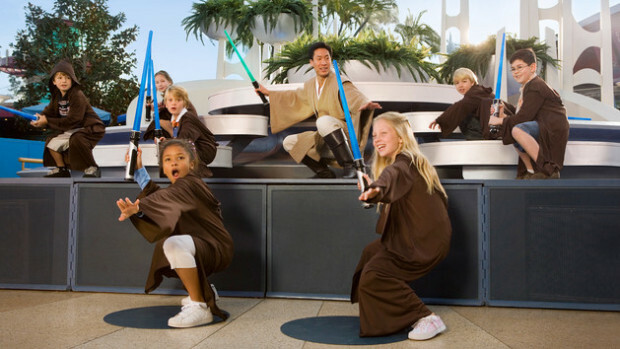 Kids who are selected to perform in the Jedi Training Academy not only get to dress up in Jedi robes and fight a Sith Lord, but they also receive a special pin certifying them as having completed the Jedi Training Academy. The process of getting picked for the Jedi Training Academy recently changed. Now, parents must register their children in the morning for the show at a booth across from the entrance to Autopia. Here parents will be given a time to return with their children so that they can prepare for the show. This is a change from the random selection process that was used previously. This new method ensures that if your child really wants to participate in this, you can make it a top priority. Disneyland offers a free Package Check Service. If you are staying at any of the Disneyland Resort hotels, you may have your package sent directly to your room. You can also just have the packages held in Disneyland Park at the Stroller Rental area, The Star Trader, or Pioneer Mercantile and in Disney California Adventure at Elias and Company. In order for your purchase to be stored here, you must have the receipt for item and the item may not be a limited edition run. 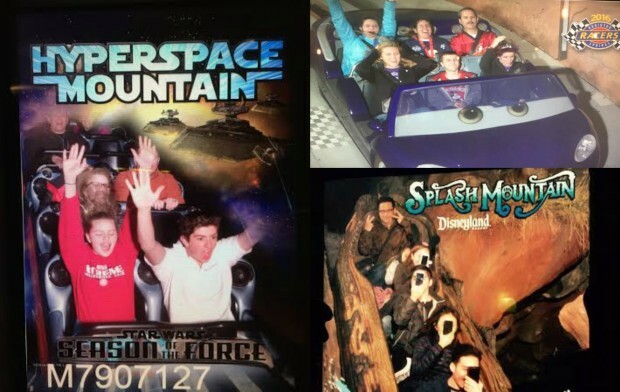 Your photo is taken on many of Disneyland’s most popular attractions. On many attractions you can purchase your photo at the exit (they also display your photos, so be sure to grab a picture of the picture). On Buzz Lightyear Astro Blasters you can actually email your photo for free. Along with the photo your point total is nicely displayed. This is a very nice practice in comparison to other theme parks such as Sea World where they have special face blockers that prevent the faces in a picture from displaying correctly if you attempt to take a picture of the picture. You can now download all of your PhotoPass photos for free as part of your subscription to Disneyland MaxPass. Update September 10, 2017: This item is no longer free. 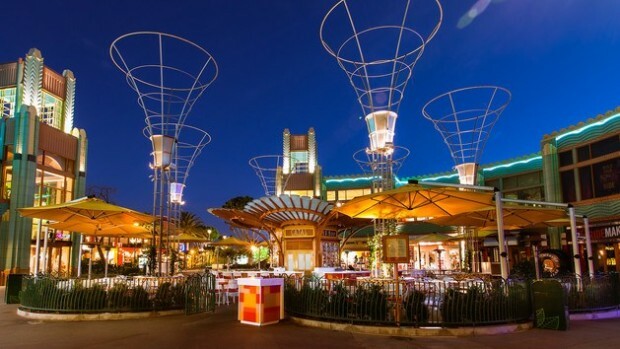 The Downtown Disney parking lot offers two hour parking when you make a $20 minimum purchase and receive validation from a Downtown Disney location or four hour validation when you eat at a table-service restaurant or see a movie at the AMC theater. These rules can change during the busy season, be sure to check at the parking lot upon arrival. You can park for three hours of free valet parking at Disney’s Grand Californian Hotel or Disneyland Hotel when you validate your ticket at the Napa Rose or Steakhouse 55 respectively. Again, check on the exact amount of time upon your arrival at the hotel. Tipping the valet is customary regardless. 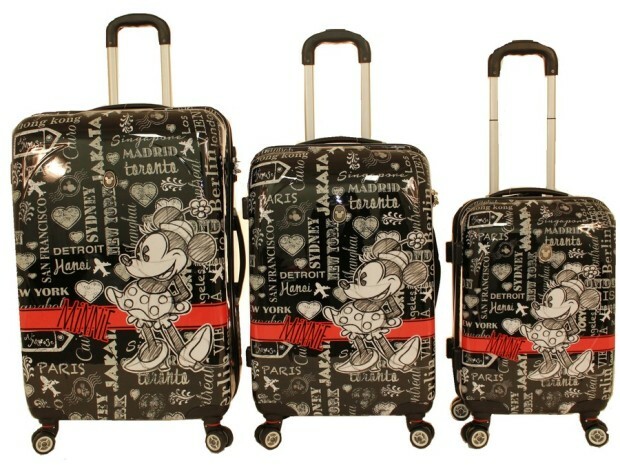 Any of the Disneyland Resort hotels will provide luggage storage on the day of your arrival or departure. There is no known rule stopping non-hotel guests from using this service. This can be helpful if you are arriving from the airport early in the morning and want to go directly to the parks rather than stopping at your hotel. If you choose to store your luggage at one of the hotels, be sure to tip the valet. 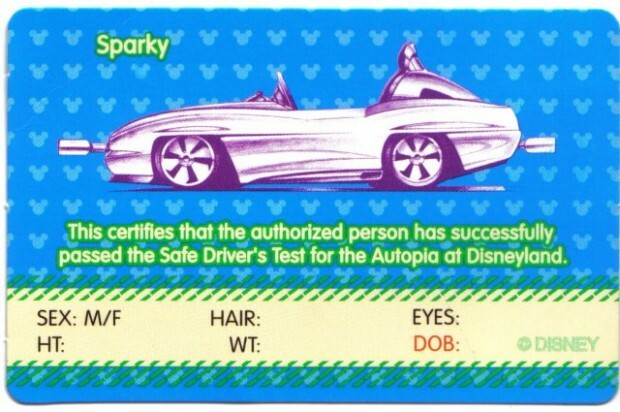 Before hoping in your Autopia car, be sure to pick up a free Disneyland driver’s license. You can skip the DMV line for this one. The attraction has undergone a renovation to add a new sponsor to the attraction. We will have to see if they are still giving out the licenses in the updated attraction. Update 5/23/17: The Autopia Driver’s license is no longer given away for free. You can purchase your own custom license in one of the booths by the exit for $5. 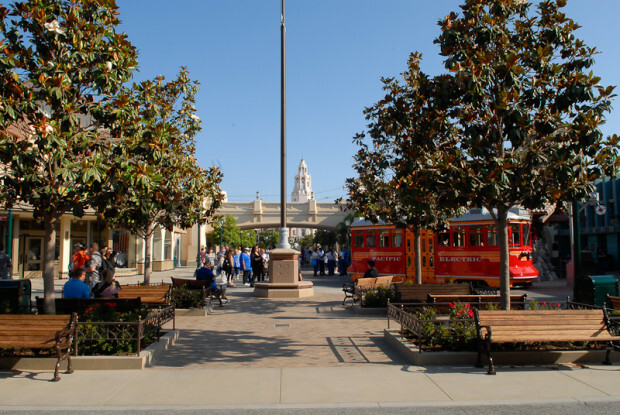 The entrance area of Disney California Adventure, Buena Vista Street, has its own newspaper called the “Buena Vista Street Bugle.” I make sure to pick up a copy every time I am in the parks. It acts a time capsule of what was going on during that visit. Update September 10, 2017: The free Disneyland maps are currently not being offered. This section will be updated when a new version of the Buena Vista Street Bugle is released once again. 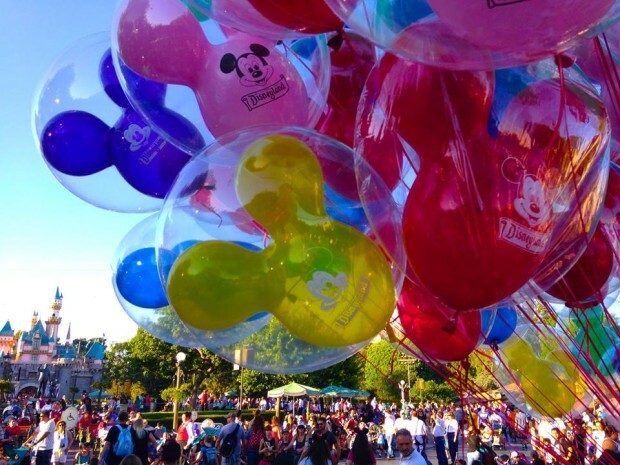 Any Disneyland Balloon Cast Member will give you a replacement balloon if your balloon has popped. Simply bring the remnants of the first balloon with you to the Cast Member. Update: As of 1/28/17 they were no longer handing out these free Disneyland recipe cards. 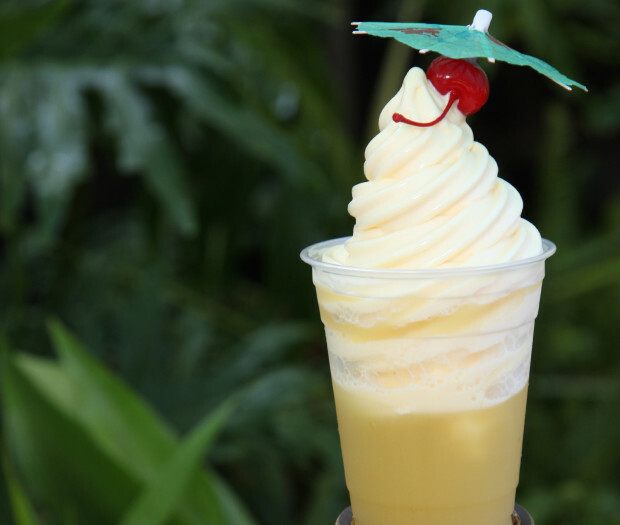 There are seasonal recipe cards available at the Dole Whip bar in front of the Tiki Room. The recipes vary and come on a postcard sized piece of paper. You can also request the recipe for almost any dish that you eat at City Hall in Disneyland or the Chamber of Commerce in Disney California Adventure. The First Aid stations in both theme parks provide free doses of over the counter medication and cool dry storage of medical devices such as breast pumps or nebulizers. 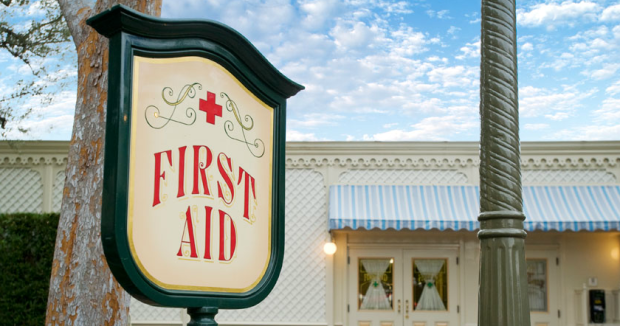 Ask any Cast Member for directions to the First Aid facilities in both theme parks. All three of the Disneyland Resort Hotels provide free WiFi in the lobby. One of my favorite spots to get work done or check in during our vacation is on one of the comfortable couches in Disney’s Grand Californian Hotel. You can also head up to the third floor of the hotel where there are more couches, it is even quieter, and there are far fewer people. Disneyland not only has a wide variety of fantastic foods, they also have some unique flavors like the Mint Julep drink or dill pickle, bacon, and nacho cheese flavored popcorn. Each of these food stands are happy to offer samples of their food before you commit to a purchase. Update 5/23/17: Disneyland no longer provides free samples of popcorn. You can still request free samples of the Mint Julep in New Orleans Square. Dining at any buffet restaurant (including Disneyland character dining) at the Disneyland Resort is free for anyone under three years of age. Consider eating at the buffet if you want to avoid purchasing the kid’s meal at other a la carte restaurants. Related: See our full Disneyland character dining review. 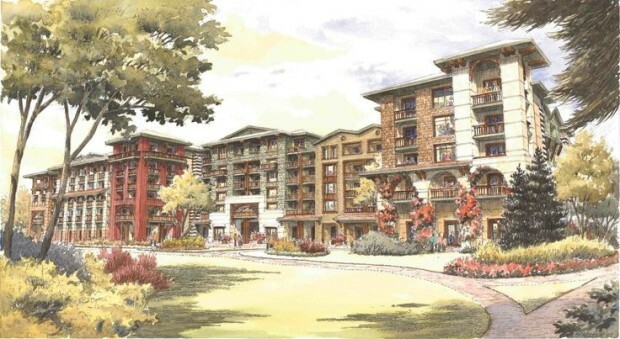 Disney’s Grand Californian Hotel pays homage to the classic 1800s and early 1900s Arts and Crafts architecture style. A Cast Member hosts the “Art of the Craft” walking tour of the hotel property sharing stories of the history that inspired the design of the hotel. This tour is a hidden gem for any fan of architecture or history. Check in with the Guest Services desk in the lobby of Disney’s Grand Californian Hotel for more information on the availability. The tour is open to guests staying at the hotel and those just visiting the theme parks. Generally the tour is held Sundays, Mondays, Thursdays and Fridays at 1 p.m. 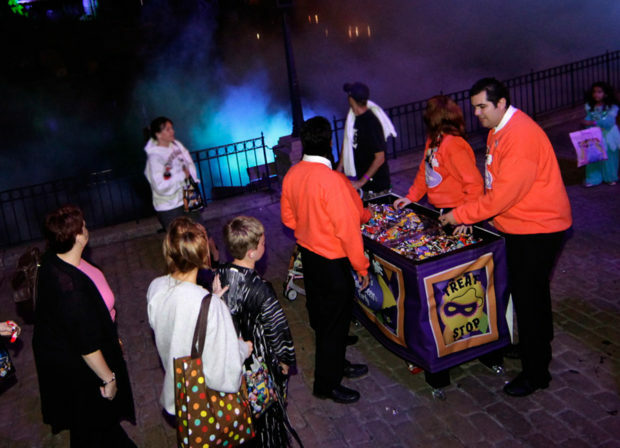 When you attend one of the Disneyland Mickey’s Halloween Party events, you will be given a bag for collecting candy and huge handfuls of candy throughout the park at the various trick-or-treat trails. There are also healthy snack options you can request at each station instead of the candy. While this is a separate ticket event, the special take home items are a nice addition and are worth mentioning on this list. This wasn’t an original item on the 34 FREE Disneyland Things list and was added later (this is item number 35). Click here to read more about the Disneyland Mickey’s Halloween Party 2016. As part of your stay at any of the Disneyland Resort Hotels there are numerous perks that add to any resort stay. You can request a wake up call from one of your favorite Disney Characters. The concierge at each of the hotels has scavenger hunts that send you throughout both theme parks looking for clues. When you return the completed hunt to the front desk, you will receive a button depicting some of the attractions you experienced during the hunt. I am constantly writing notes and to do lists in my everyday life. One of my favorite ways to bring the magic home with me is to use the pens and note pads collected from the Disneyland Resort. I have picked up generic Disneyland pens plus unique pens branded to each individual hotel. 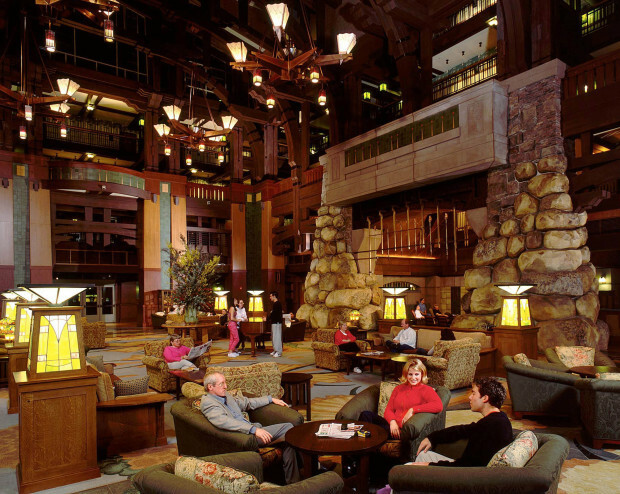 Disney Vacation Club Members have free DVD rentals during their stay at the Grand Californian. 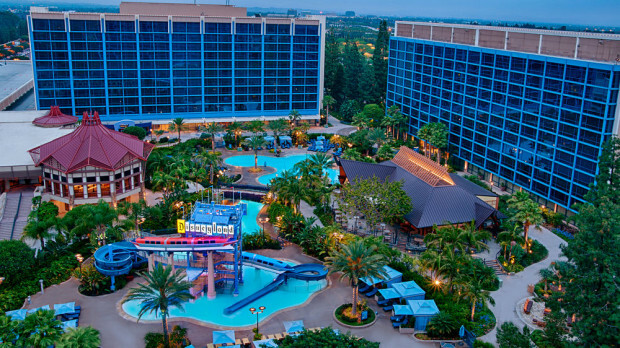 Click here for more information on the deepest discounts at the best hotels near Disneyland. There are even more amazing free things that can come when you book your vacation as a package. As an incentive for your booking, travel agencies offer wonderful extras. 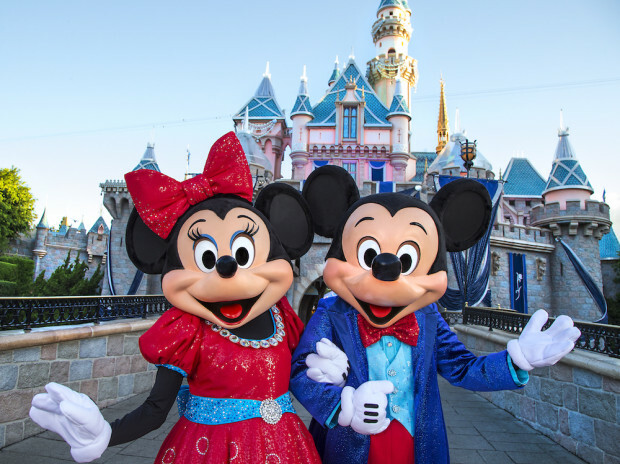 We partner with Get Away Today to secure exclusive low prices on your Disneyland vacation and to get the best assortment of additional free bonuses when you book your vacation. 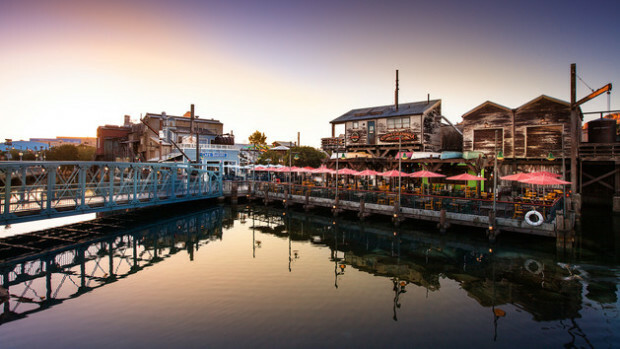 Exclusive Area Coupons: Upon purchase you will be emailed a PDF of coupons that can be used repeatedly for 10% off the hottest Downtown Disney restaurants including La Brea Bakery, Catal, Naples, Tortilla Jo’s, and the Uva Bar. Also you will find other coupons for chain restaurants in the area. Pin lanyard: Each adult in the group will receive a free pin lanyard to carry any Disney pins you purchase as well as your park tickets. Disney sling backpack: Each child in the group gets a free Disney sling backpack perfect for carrying in the parks. Fun Free Printable Downloads: As a fun way to get prepared for your trip, you will receive special printable sheets including games, vacation countdown chains, vacation reveal ideas, and more. You can read all about the bonuses and the exclusive discounts you can receive in our guide to booking Disneyland packages. 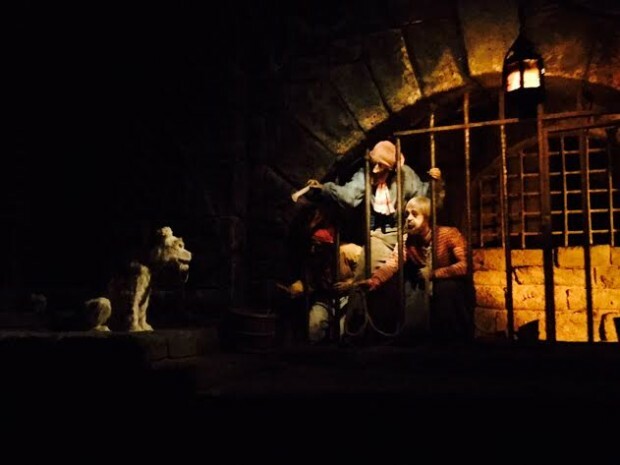 If you enjoyed this article, you can find even more Disneyland history, tips, and secrets in our Disney Dose Newsletter. If you are planning a trip, be sure to check out our other website at MickeyVisit.com for the Mickey Visit Disney Deals Email that features exclusive discount prices on tickets, hotels, and dining in and around Disneyland. All the information and coupons are very helpful, I won’t be able to take another trip to Disneyland again, I am a single parent and used my income tax to make this possible for us and so far I am very pleased with all the information we have been getting to make this trip a real fantasy for us. I hope you have a great trip Eva. Thank you for leaving a comment. There is no such thing as anything being free inside Disneyland. You pay to enter. And it cost an arm and a leg. They can keep their stickers. Thank you for your comment Julie. LOL….. you could go to Knotts Farm for half the price, but then you only get half the experience (frankly I thought Knotts was boring and never went back). 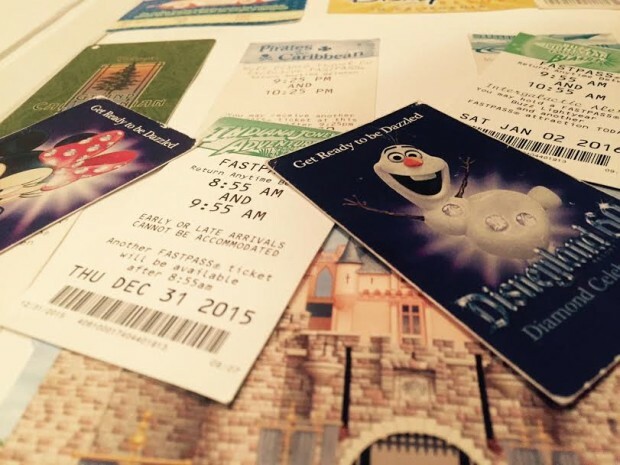 At Disney you pay $90 for about 16 hours entertainment (8am to midnight)…. that’s only 6/hour which is cheaper than seeing the latest movie blockbuster. Well said on the hourly cost. I always take this into consideration. My family isn’t thrilled when I stay in the park from 7 am until 2 am on New Year’s Eve, but I always get my money’s worth. Our last family trip to Disneyland was November 2015. We were told that they were no longer giving out free maps at the Jungle Cruise, and free Drivers Licenses at Autopia are no longer handed out as well. Aimee, I was able to pick up the Jungle Cruise map this December. They switched paper type for the maps, but they are distributing them once again. I seriously love these DL articles! We’ve been to WDW enough to be familiar with it but are taking our first trip to DL next May. I’m soaking up all the info I can before we go. Thanks for the info. Very nice to have you here Sharon! You can find more Disneyland planning info here. My family and I went to Disneyland between christmas and New year’s. We were given hats and horns on new years eve. It was such a fun surprise. On our last night in the parks a cast member named Kevin gave all of us “I’m Celebrating” buttons. He even took a minute to customize each of them differently with a sharper. All of them had 2016 written on them while some had balloons or hearts or mickey ears. Those buttons are such a treasure to us and a wonderful keepsake. It’s awesome that Disneyland offers some free tetracycline these. It really makes your experience even more special. That’s a very nice experience Julie. I still have all of my celebrating buttons from birthdays for years. I have done a few of these things before. So much fun! 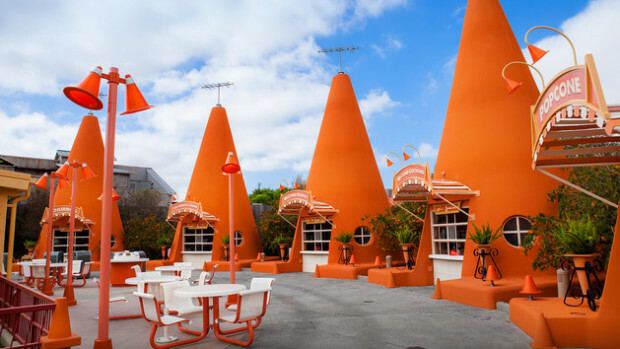 I cant wait until I go to the parks again and get to check out these new things. Thank you for providing that info Taryn. We got to ride in front with the captain of the monorail, thanks to a helpful hint in an older article. You just need to be the first person to ask. Hopefully, the people riding with the captain to your station, are getting out at your stop so you can take their place. Quite a different view! Happy that you could put the tip to good use Janie. So much fun! We just got back from Disneyland and unfortunately driver’s license at Autopia is not free anymore. At the end of the ride you can go to a booth, pay $5 and take your picture then print out your plastic ID. I didn’t mind paying for it because it’s a good souvenir and it’s probably the cheapest souvenir that I bought at Disneyland! I thought they had free ones that don’t have your picture. Thank you for the update. One thing you missed which I think is unique to Disneyland. People watch and talking in the lines. I always take an afternoon break on a park bench in the hub (with popcorn). Watching families discover the park (even today, there are plenty of first-time visitors), especially the kids, is joyful. 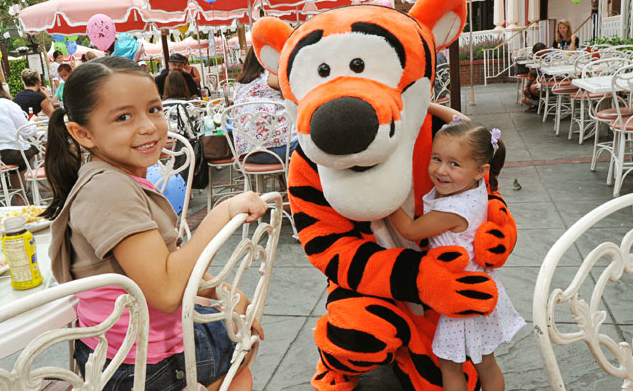 Watching kids meet their favorite characters is a special treat. In line, strike up a conversation. I make a lot of friends there, all Disney fans. When we went last summer (2016) my girls got a neat pin after the Jedi training, not a certificate. They were showing it to Kylo Ren when we met him to let him know they weren’t scared of him.? The Bugle is no longer printed, sadly. Went on a wild goose chase for it today! Thought it would be such a great souvenir. Hopefully they bring it back! Thanks for the great tips!